At beginning of the year 2018, planet Saturn is in Sagittarius sign (5th house for Leo sign) and Jupiter is placed in 4th house. 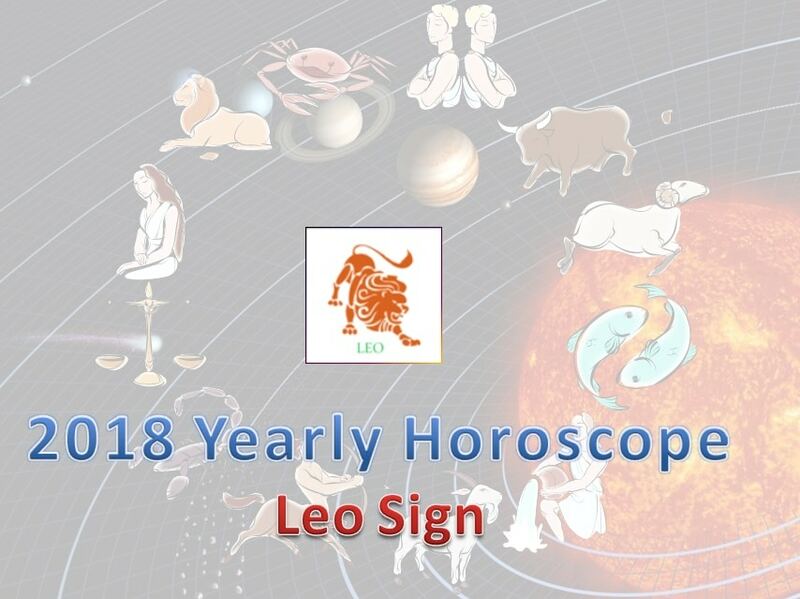 This New Year 2018 will be a good year for Leo sign as this will bring in positive changes to your work or business and finances. Especially, the latter half of this year will have favorable placement of planets that will bring you good growth for 2018 yearly horoscope for Leo sign. Young Leos will have suffered in your work and studies due to the presence of Lord Saturn in your 4th House (Arthashatma Sani). Your confidence level would have gone down. Especially, those in top managerial and leadership positions would have faced problems to their leadership, complex managerial issues that would have threatened their position. Some would have had their reputation damaged. But this year will bring in fresh renewal and growth to you. Hence there is no need for worry. The issues which had plagued you for the past few months will start to vanish as the Arthashtama Sani had already changed his position. Lord South Star (Ketu) is in your 6th House which will bring you good results all year long. Lord North Star (Rahu) is in His favorite Moon Sign cancer, which will bring you good fortune to your life. Some of you might travel to Western countries for business or career purposes. Especially, you might find jobs in Islamic countries. Your other religion friends, Islamic and Christian friends will be helpful to you. Similarly if you are a Christian or an Islamic, your other religion friends, Hindu friends will help you out. When Ketu is in a favorable position in either your birth chart or in the present planetary positions, He will bring about a shower of monetary fortune through unknown deals. Sine He is a lucky position for you, you will earn money through ingenious ways and means. Due to Lord Saturn’s malefic influence for the past two years, you might have been unhappy with your job. Now, you will get a job of your dreams with good salary. Those in politics, social work, media, artists, cinema and journalists will have a great time ahead. Especially people in entertainment business will see drastic changes in their career. The obstacles that prevented circulation of finances in your side will disappear. Your financial situation will improve beyond recognition. You can keep up your promises. If you promised your friend money tomorrow, you can gather the required funds by today. Small disputes, misunderstandings, marital discord, joint family issues will vanish under the beneficial aspects of the planets. Your family will be united and bring joy to you. Youngsters of marriageable age will get married. Those who are divorced will get a chance to begin a second life that will last with peace. People awaiting children will be blessed. Whatever things you needed to buy for your house will be bought this year. The latter half of this year will see sudden showers of luck on you, especially in the gambling sector, stock markets and speculation. But this may not hold true for all Leo sign. Depending on your birth chart and the other planetary positions in your chart, you might even lose money in stock market. Hence you should be careful even then. Your financial situation will be highly satisfactory and cash flow will be good all year long. Whatever you take up will be successful. If you had money troubles with no proper income, then all your financial issues will be solved and you will have a generous amount of money in your hands this year. As all the planets are in a friendly beneficial position except planet Jupiter, you should shed off your doubts and put concentrated efforts in your work. Businessmen, self-employed, vehicle operators, tradesmen and others can expand their business or start new businesses at other outlets. This is the best time for doing this. Your partners with whom you had misunderstandings as the business was slow will come around and be supportive. Your partnership businesses will also pick up. Your father will be supportive. He will help you out. Your paternal properties will bring in profit. Farmers have a good year ahead. Their profits will be wholesome. Families will see celebrations and parties that bring in great joy and cheer in the household. Especially farmers who grow commercial crops will be highly successful. As planet Saturn is in your 5th House, keep an eye on your kids. They might deviate from their studies and waste time with bad friends or infatuation and such. So be careful that they don’t embarrass you or cause trouble. Summing up, 2018 is a wonderful time to forge ahead with new plans as your financial situation is well-placed. Keep working hard and God will take care of the rest.